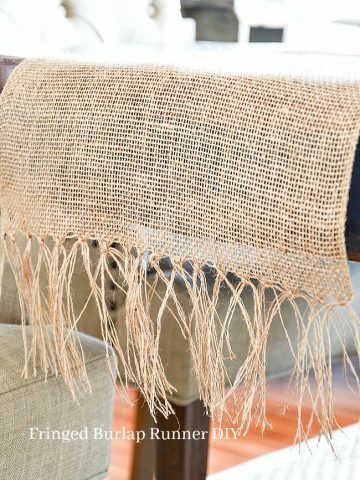 Did you ever see something and think it was so cute and adorable… and very chic and earthy at the same time… and made of nubby burlap…and you just had to make it! Yes?…you know that experience? Good! Well, that happened to me when I saw burlap acorns on pinterest. 2. Cut a circle of burlap large enough to cover all but the top of the smaller end of the Styrofoam egg. Put hot glue in the center of the burlap, place the large end of the egg on the center of the burlap and smooth the burlap to adhere to the egg. BE CAREFUL not to burn yourself (and you thought I was kidding about treating my burn!). 3. 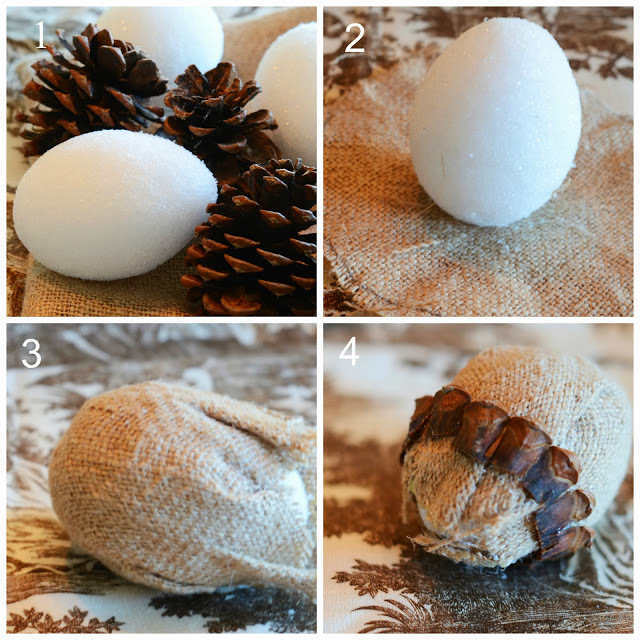 Hot glue the burlap around the egg, smoothing it the best you can. The toile is not as forgiving as the burlap, so I made small folds here and there. 4. Cut apart the scales of the pinecones with sturdy scissors. Hot glue them in a circle near the small end of the egg. Continue to glue the pinecone scales around the egg until you get to the top. Push a small stick into the top of the styrofoam. Finish adding pinecone scales until the top of the egg is covered. See what I mean…I bet you are thinking this is so cute and adorable… and very chic and earthy at the same time… and made of nubby burlap AND FRENCH TOILE…and now YOU can’t wait to make them! You may want to pin this to your fall Pinterest board. You can follow me on Pinterest by clicking HERE. Fall is my favorite time of year and acorns are my number one way to decorate. Thank you this beautiful craft. I can’t wait to get started. Ahh! I LOVE these, they are darling! I wish I had a whole basket of them. This is one of the most creative fall decorations I have ever seen! Thank you so very much for sharing your creative spirit! You are very much appreciated! Happy Fall! Absolutely LOVE these!! What a wonderful idea and so beautifully executed. Thanks so much for the idea. Really appreciate the tips on your blog! I will be making these tomorrow! Some for me and some for our church bazaar! Do you use burlap as it comes off the bolt or do you use some of the yardage you have softened? Hi Victoria, For this project I use burlap as it comes off the bolt. The stiffness really helps. Yvonne, what a blessing your site has been to me! I love to decorate, and you truly inspire me! God’s love radiates from within…as truly your home is made from and filled with love. Look forward to your next posting! I love these Yvonne!!!! Thank you for sharing such a great idea. Keep up the great work, I think you have the best blog around!!!! Hope I can find the eggs. Really want to make them for my friend. put prep H on your burn immediately – won’t even have a blister! Wow, thanks Elaine. Never heard of that! Hi Yvonne, the link to the minestrone is not working. Is it an issue on my end or is the link incorrect? Love your blog, love your style, amazing! Fabulous, fabulous tips Valey!!!! Thanks for sharing! 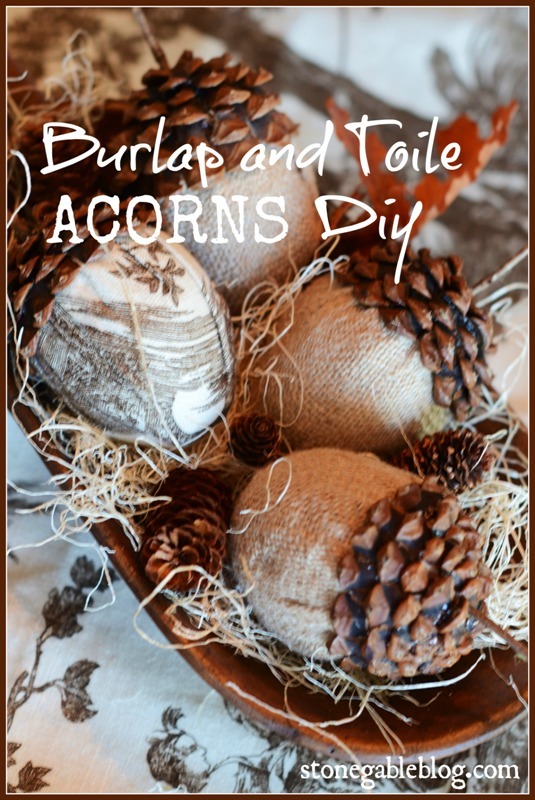 Love the burlap acorns,i am going to make them for New fall décor.Also will do some for my Sister’s Church Fall Bazzar,craft table..They Are adorable!!! You inspire me to be a better Christian. You also give me lots of decorating inspiration. Thanks for all you do. Love these acorns Yvonne. I definitely need to try this. We have zillions of pinecone.Thanks for sharing this great idea. I was just able to read this post and see the how too on the acorns! They are just so cute. Can not wait to make them. Thanks for the idea,??? 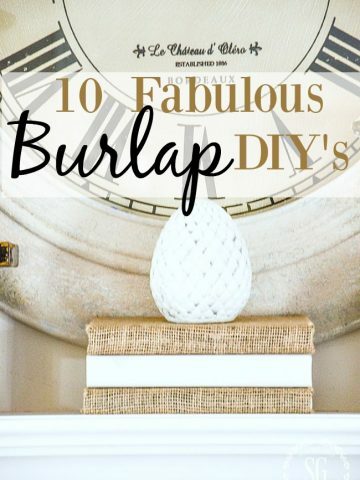 I LOVE your burlap and toile acorns! I recently saw some made with leaves on Thistlewood, and had been trying to think how I could make those (other than using the usual popped balloon inside)! I’m so excited to find out you used styrofoam eggs ~ such a simple solution, I’m wondering how I could not have thought of that, of course! But that’s why you have a blog about gorgeous things, and I don’t, right?!? Thanks you for being there with such beautiful answers to our wonder-filled questions! 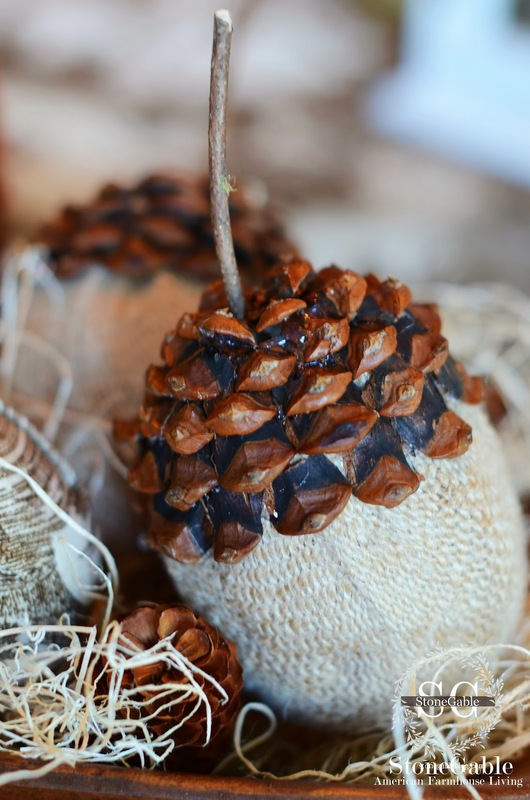 I am SO glad to have just happened upon this Pin … now I can make some of these stunning Holiday acorns! Love your blog, and keeping up with you, but I did not find StoneGable till after the post about acorns, unfortunately! Welcome to the StoneGable family, Kathleen. I’m so glad we found each other! I know that feeling! I get inspired by things I see all the time and just have to make it! 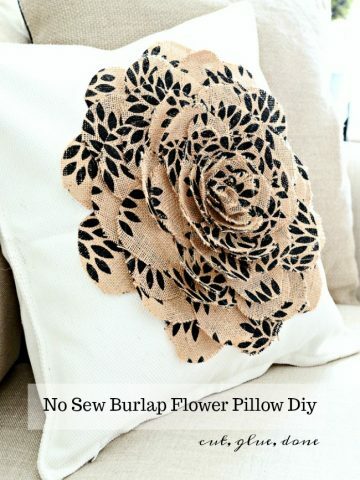 I have seen these before and they are on my list to do, but I just love the toile you used with the burlap! Very sweet! You did an awesome job too! Love them! Those are adorable!! 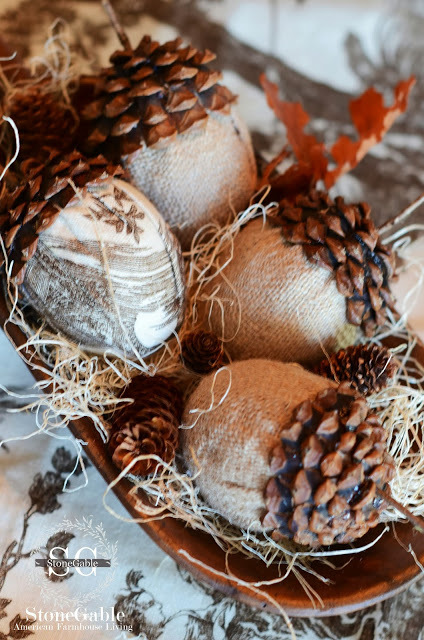 Funny that you should do this DIY as I’ve got a project on my ‘to-do’ list to make fabric acorns…but they don’t involve a hot glue gun! lol You’ve inspired me. I LOVE these! I’m pinning them as they are definitely on my to do list. Thanks for sharing! Yvonne, The acorns are adorable and I love them! 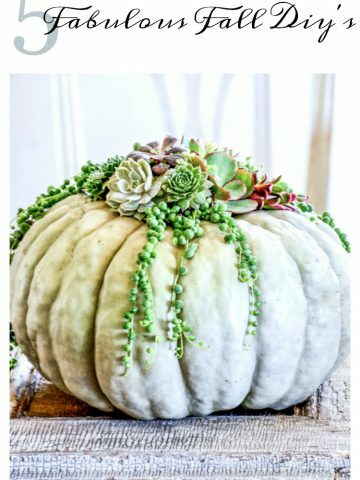 What a cute idea for Fall. Aren’t you one creative soul! Those acorns are so adorable! Absolutely love these and there are so many things you could do with them to decorate for the season! These are cuter than a bug’s ear Yvonne! So sorry about the burn! 3rd degree?! When you go for it, you don’t kid around! Those are adorable and I think the burn was worth it. OMG!!! I LOVE them Yvonne!! Adorable! Thanks for sharing a great tutorial! I really love this idea! Yvonne, you are just so freakin’ awesome! Have I told you lately how much I love your blog? My problem is that I don’t have enough table-top space for all the cute ideas I’ve “borrowed” from you! Bless you! ADORABLE! I may just give these a try! love the look. Good Job! so cute, love love love the toile!! love the look.. might have to give these a try..
thanks so much for the detailed tutorial..
so sorry you got burned.. also vera would help if you have some. so does yellow mustard…it’s not just for hot dogs! Takes the pain away after a few minutes. Kind of messy but it really works! I can testify to what you say after a friend shared with me. True, maybe a bit messy but it works! Simple and beautiful! Pinned these to hopefully put together this weekend! Thanks for the tutorial! Very, very cute, my clever blog friend! Loved your tour! I too, avoided the yearly crawl under the house for Rubbermaid Autumn decor storage box! I love to come visit you every day, Yvonne! Your home is the just right combination of elegance and Lancaster County farmhouse. I get inspired every time! Your house tour was fabulous! Thank you so much for all the work you put into each and every blog. You are inspiring! Oh how cute, simply delightful addition to your fall decor! I LOVE these, Yvonne! They are so cute and I love the fabrics. oh my gosh these are so freaking cute.. and I have everything on hand to make a few.. thanks for sharing how you did it. I am crushing on your acorns big time! You are so right when you said now I have to make them. 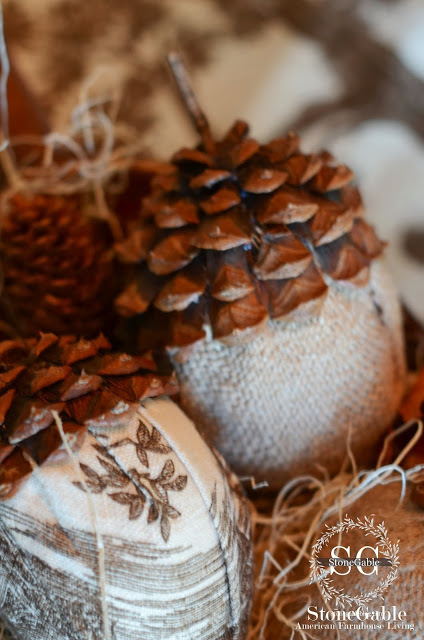 In the mean time, I’m getting out all my xmas acorn decorations and making them work for Fall. I love these and they look so cute! Can not wait to pick up the eggs to make these. 🙂 Thanks for sharing. I love, love, love these!!!! Stunning! Will definately give these a go! And thank you for the gorgeous tour of your elegant home. 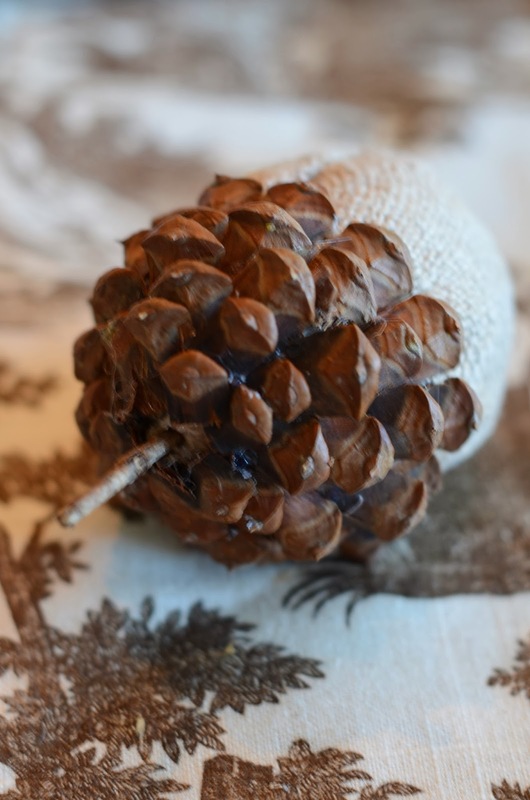 Love those – and I just collected pine cones yesterday! Thank you!